Divya's culinary journey: Dry Chilli Chicken Recipe | Boneless Chilli chicken | Easy Restaurant style Chilli chicken. Dry Chilli Chicken Recipe | Boneless Chilli chicken | Easy Restaurant style Chilli chicken. 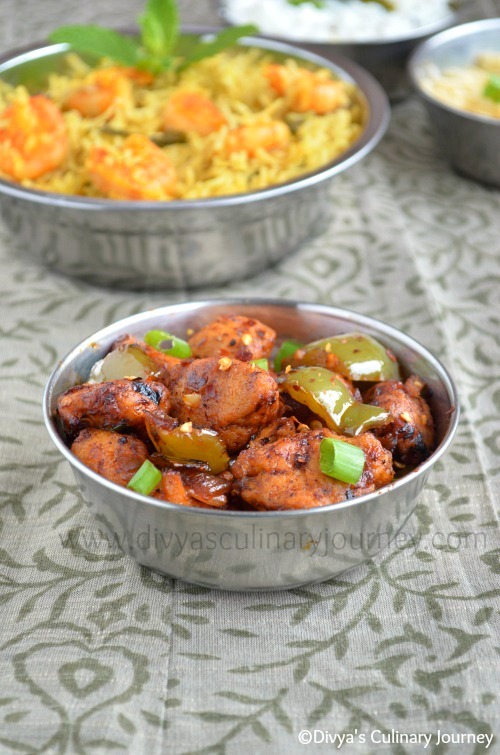 Today I am posting the recipe of Chilli chicken made with boneless chicken. This dry version of chilli chicken can be served as an appetizer. This is my first indo-chinese post here. This boneless dry chilli chicken is also one of my favorites and usually order it when we go to restaurants. I tried recently at home and kids loved it too. Combine corn flour, all purpose flour,egg white, salt and pepper and then mix with chicken and let it marinate for at least 30 minutes. Then deep fry the chicken and drain excess oil and set it aside. In a pan, heat oil, add onions, green chillies, bell pepper and fry till onions turn translucent, then add ginger and garlic and fry for 2-3 minutes, then add the tomato sauce, chilli sauce, soya sauce, vinegar and red chilli flakes, mix well then add the fried chicken, check the salt (if needed, add a little) and mix well till they are well coated and fry for another 3-4 minutes till all the liquid evaporates and turn off the heat. Garnish with spring onion and serve it warm. Adjust the chillies, chilli flakes etc., as per the personal heat tolerance level. Adding egg white is optional for frying the chicken, you can replace it with besan. Add 2 teaspoon of besan with corn flour, all purpose flour,salt and pepper, add required water to make a smooth mixture and then marinate with chicken and proceed. I had made this last week but dint take the picture.. delicious..
in india, pourtasi month already start aayduchi divya.. its really hard to stay away from non-veg recipes during this month :) chicken is so tempting dear..
luks very hot n spicy..wonderful cliks. Delicious and that is so tempting esp for the chilies I find hard to resist. And my mouth waters all over again....didn't have breakfast, so this is outrageously titilating my senses. Yumm!! looks so delicious, love the dry prep. 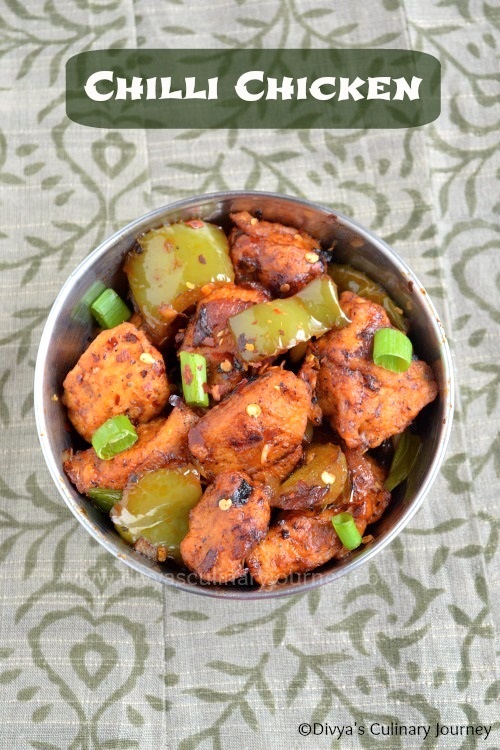 Excellent and mouthwatering chilli chicken.. Pics look delicious. Just makes me drool, wish i get that bowl.